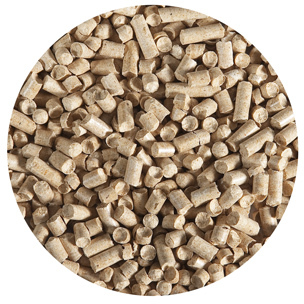 6 kg - 10 l - Wood pellets made of 100% natural wood fibres and sawdust - dust-free - Very good moisture/odour absorption: Absorption 300%, Fibres act like a sponge, Natural wood fragrance neutralises unpleasant odours - Granule Ø 6 mm - 100% biological degradable: can be placed in vegetable refuse container - Dries very quickly: hardly sticks to paws - Remove excrement every day and replenish - Completely replace once a week - Double-sided packaging - Used litter can be used as compost or for soil improvement - bottom covering - thanks to high absorption (300%), the filling is economical in use and removes unpleasant odours. 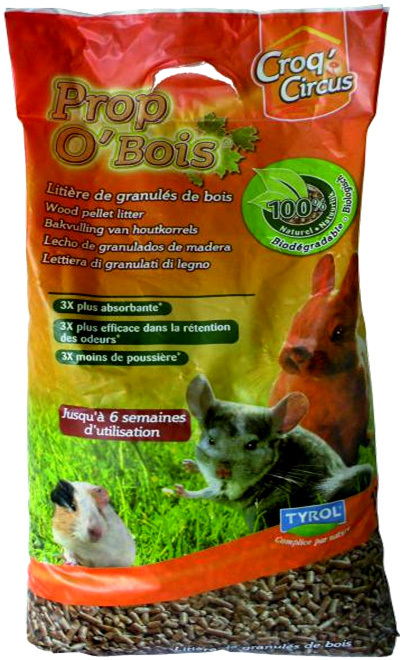 Package is made from 100% recycled polyethyelene with no toxic resicue on incineration and requires less energy to manufacture. 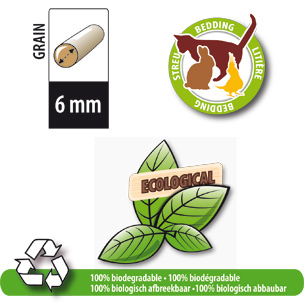 100% natural, 100% Biodegradable, 100% compostabile.